Before I get back to Thanksgiving, I wanted to let you know about something fun I’ll be starting tomorrow here on the blog! Every Tuesday in December, I’ll be participating in A Pinterest Christmas with friends and friends of friends across the country! Each week, we’ll be posting Christmas crafts that were (p)inspired by Pinterest. Stop by tomorrow for my first post! All right, on to our next Thanksgiving installment! We had a few trips down to the beach. It was a little chilly, a little windy, and a lot of fun! GiGi armed Charlie and Annie with mini pink shopping bags and they were determined to collect all the shells. Charlie was having some pants issues that resulted in him looking like our own personal plumber. Margot loved the beach, too! Nathan and I went on a run right before our beach trip, which is why we’re looking so sporty It was the first time we’ve ever been able to run together! It’s kind of impossible to do so with two kids, a single jogging stroller, and a toddler that is a VERY erratic and unreliable (read: fast fast fast!!! Stop, get off bike, get back on, go very very slow, get off, push…you get the point) tricycle rider. The Massini family! I think this might have been Eric’s first trip to the beach. After the beach, it was time for a guitar duet. Charlie and Annie love playing their guitars together. They usually end up playing each other’s for some reason or another, and they ALWAYS need to use a pick! Annie loves to say, “Sally, (or whoever else is around) do this!” and then makes a sassy face. It is hilarious every single time. Charlie has not perfected the sassy face. 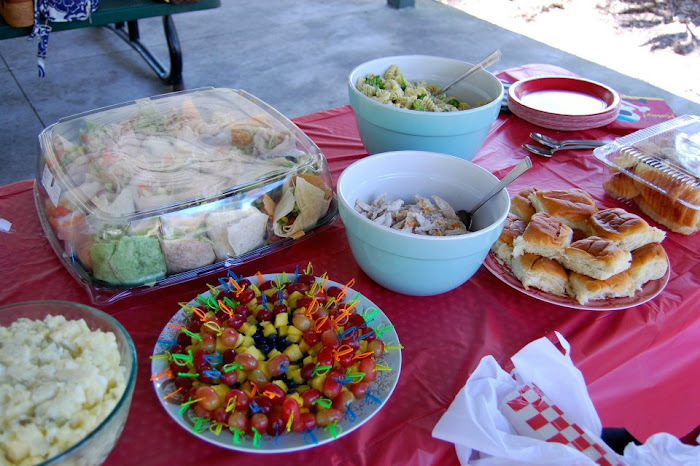 Thanksgiving dinner was delicious, as usual! These kids were ready to eat! And Buzz Lightyear even showed up for dessert! A wonderful long weekend with family and friends! We had such a wonderful Thanksgiving, our first holiday with four (!) grandchildren at the Massini house! All the Massini kids and our families stayed at the beach, which made for quite the full house. There were multiple times when we felt like we were in Home Alone, only we weren’t going on a fancy vacation, in an airport, or missing any of our children. You get the idea, chaos. Charlie and Annie were roommates. They loved sleeping on their little cots. They’re on quite different bedtime schedules, though, so I don’t think Charlie ever even really noticed that Annie was sleeping there. She would go to sleep after him and he’d usually wake up in the middle of the night and come to our room or just really early in general and not even notice her! Charlie really seemed to come out of his shell last weekend. He is normally extremely shy and doesn’t really play with other kids very much. If he does, he’s very quiet and calm. Annie brings out the rascal man in him. There were multiple times we caught them WRESTLING upstairs. They had so much fun playing together and shared very well. There was a moment where Annie got quite mad at him, though. It was quite a hilarious situation. Annie came out wearing an adorable plaid dress. As she was holding it out for everyone to see, she said, “Charlie, look at my dress! LOOK AT MY DRESS! !” Well, he looked at her, stood there silently, and then he walked away. This resulted in Annie yelling, “CARLY STOP WALKING! STOP WALKING!! !” (Annie calls him both Carly AND Charlie now!) After he didn’t stop walking, it was just too much for her to handle and she just stood there and cried/screamed. He just didn’t understand that she wanted him to tell her that she looked beautiful in her dress. Typical guy. Charlie, you have learned your lesson early. The kids had so much fun playing with their Aunt LiLi. Charlie had been talking for weeks, maybe even months about his plan for Thanksgiving: “First it’s Thanksgiving. Yum! Then, I watch Rudolph and Charyee Brown with YiYi.” He would tell me this almost every day. He got his wish! Charlie remembered Rudolph from last year. There are a few parts that scare him, all of them involve “The Bombal” as he calls it. Last year, he would just repeat to himself, “it’s nice. it’s nice. It’s really nice!” almost like he was talking himself off a ledge. Annie had a way better tactic while watching. “It’s just a story, Carly.” He now constantly tells me, “it’s just a story, mama!” if there’s ever a Bumble scene. Margot and Eric were great babies and enjoyed their first Thanksgiving! Margot spent a lot of time getting some really close looks at Eric. Hard to believe next Thanksgiving, they’ll be running around! Eric is still in the snoozy stage, which makes it very fun and easy to hold him! There is really nothing like snuggling with a tiny sleeping baby. Margot has decided to stop taking naps, except for a small 30 minute or less one at some point in the day. Hopefully she took note of Eric’s daytime sleeping habits. This is getting extremely long and I still have a ton more pictures. I’m thinking this will be at least a 3 post holiday! Margot was also baptized over the weekend, that update is coming up as well! 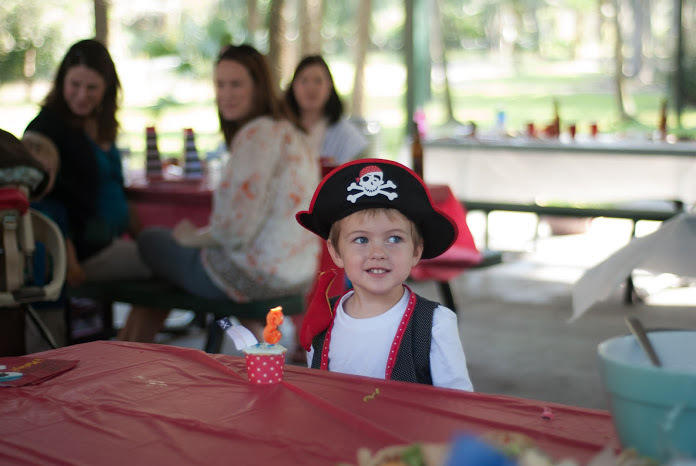 Charlie’s 3rd birthday party was pirate themed. With his birthday only a week after Halloween, it helps to keep the theme going! We held the party at a local park, which was the best idea I have had in a long time. There was no way we were fitting 35 adults and 12 kids into our house. Ever. We couldn’t have done it without the help of Christine and Adam, who came all the way from Ft. Lauderdale with their sweet pug, Hank! I’m just going to post all the pictures, you can figure out what’s happening in them Thanks to Rahul and Christine for the wonderful pictures! Get ready for photo overload!